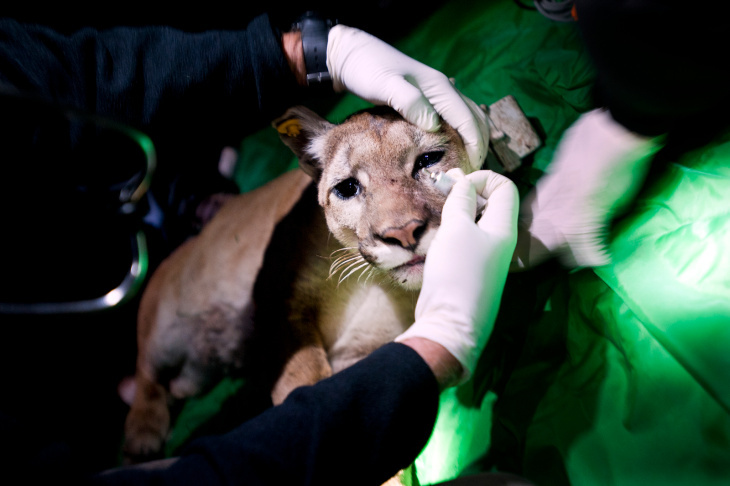 F95, a two-year-old mountain lion, is briefly sedated as researchers with UC Davis' Wildlife Health Center and other local organizations check the wildcat's health and re-apply her GPS collar, at 2 a.m. on March 14 in the Santa Rosa Plateau area. Donna Krucki, left, of Orange County Parks helps Winston Vickers place bait underneath a tree. Rat poison used by farmers for rodent control is going up the food chain, and mountain lions now are showing traces of the chemicals. 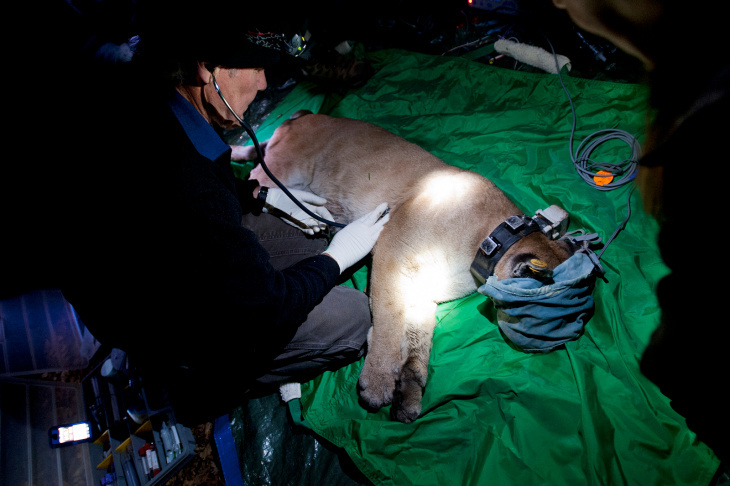 The GPS collars used for the mountain lions are used to track the causes of death to the cats, among many other things. Vehicle collisions, disease, and shooting are some of the main causes of deaths. 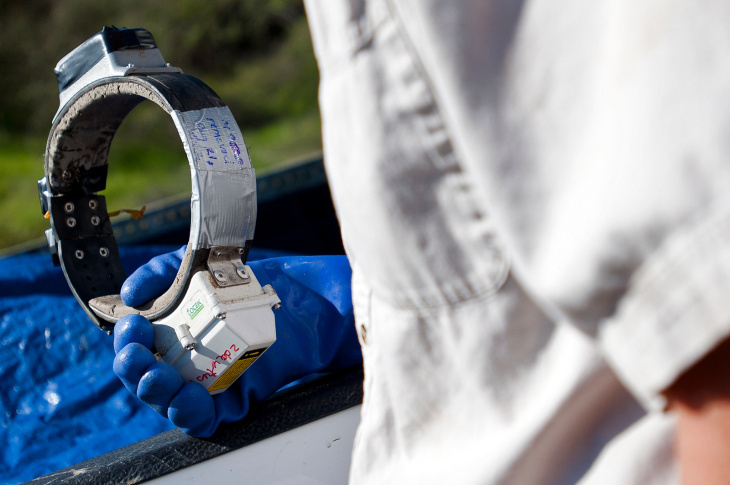 Winston Vickers places bait along Agua Chinon, near the Irvine Ranch Conservancy. The bait is securely attached to a tree using wire, so that the mountain lion cannot take it away. 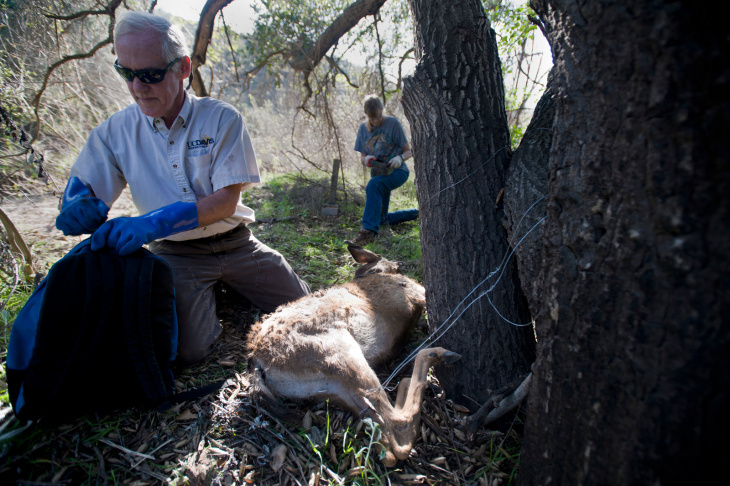 The team places two motion-triggered cameras on the bait, and wait for a mountain lion to begin feeding on the deer. Carole Bell with The Nature Conservancy points out a photograph taken of F95, a female lion that began feeding on the bait. Now the team can set up a trap at the bait location. "We got her," says Winston Vickers. He called the team on his cell phone at 12:30 a.m. After a series of false alarms and after F95 dragging the trap more than 20 feet away, the lion came back and entered the trap. 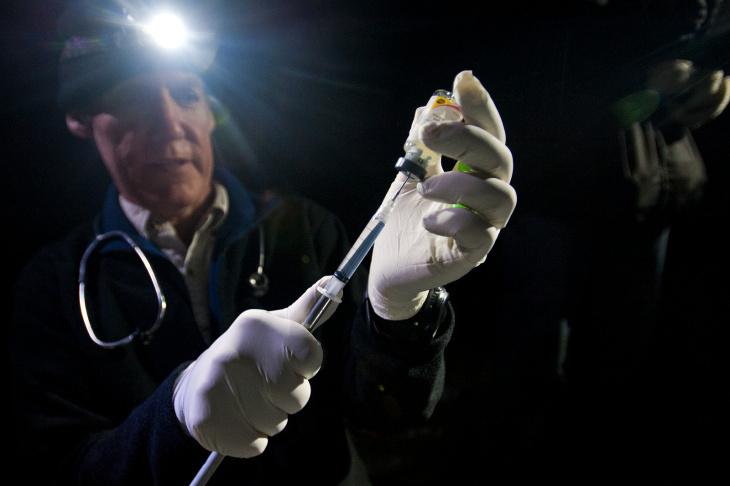 Vickers prepares to sedate the mountain lion using a syringe attached to a long metal stick. One team member distracts the lion, while Vickers slides the syringe through the back of the trap. Vickers checks the lion's heartbeat. The team takes blood, DNA and feces samples to check the animal's health. They take body measurements, and apply a new collar. F95 was first collared in April 2012. 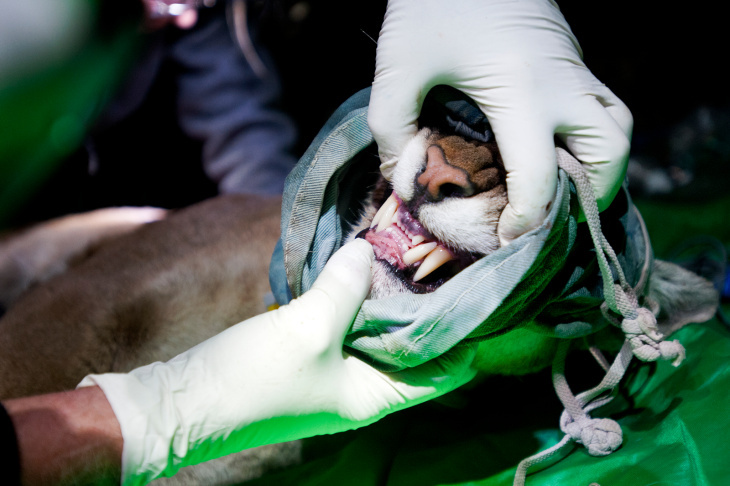 The team measures the mountain lion's teeth. They move quickly, as the animal will only stay sedated for up to 45 minutes. F95's eyes are covered with a cloth to keep her calm. Now for the final installment of our series on wild animals in Los Angeles. First, reporter Jed Kim examined how we’re dealing with a growing coyote population. Then, he took a look at what that growth means for the age-old struggle between coyotes and roadrunners. Today we follow researchers as they attempt to catch and examine an elusive mountain lion. They’re known by many names: cougar, puma, panther. Whatever you call them, there’s no bigger cat in California than the mountain lion. But being the top predator is no guarantee of success, especially as the human population grows. Studies have shown that humans are the main cause of death for Southern California’s mountain lions. Researchers are tracking the lions to see how we can change that, but first they need to catch them. Carole Bell is the manager of the Santa Rosa Plateau Ecological Reserve. Right now, she’s deep in the woods of the reserve, slicing into the stomach of a deer to prepare a meal for a mountain lion. Bell and other researchers set the roadkill deer out yesterday, and last night, trail cameras showed a hungry lion had taken the bait. Now, they’re cutting open what’s left to get to the really tasty bits. "This is going to entice them inside the trap. We want it to look good," said Bell. 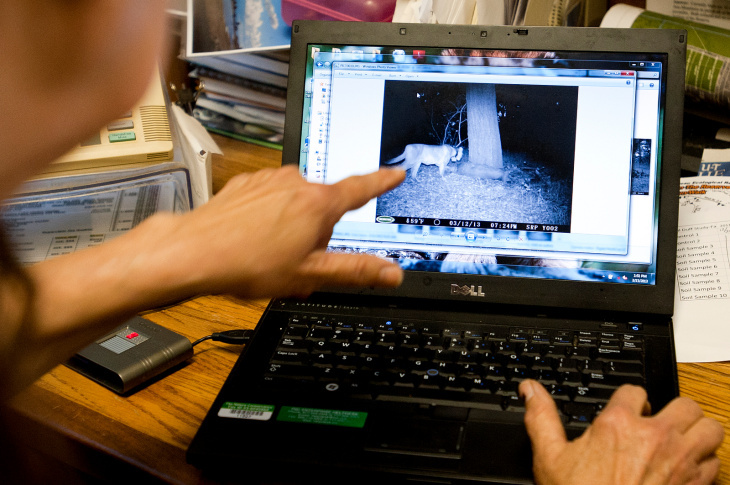 She and the other researchers are whispering, because they know that mountain lions tend to stay near their kills. They don’t want to scare one away while they’re setting up the trap. 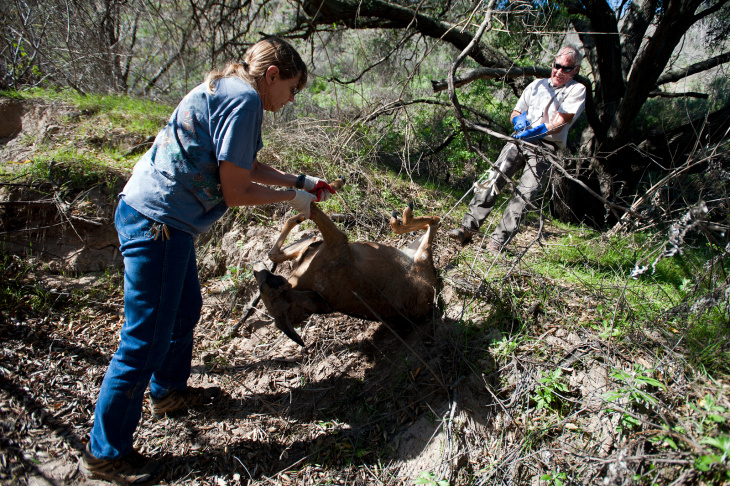 It’s mountain lion season for UC Davis’s Wildlife Health Center. Over the next couple months, scientists will be tagging and putting GPS collars on as many of Southern California’s wild cougars as they can. Bell works for the Nature Conservancy, which is a partner on the study. The field lead is Winston Vickers, a veterinarian with the Wildlife Health Center. He’s helped perfect this method of capture. "So it seems to generally work. We’ll see. Since this individual has been caught before, she may decide she doesn’t want to do that again. But we’ll see," said Vickers. Vickers checks every part of the setup. He climbs in to see if he can feel the bars. He trips the door to see that it’s working. Finally, he’s satisfied. "It’s looking good. They’ve done a very good job," said Bell. Today, they’re after a female cougar that they’ve caught before – mountain lion F-95. She’s already got a GPS collar on her, but it’s set to fall off soon, and they need to replace it. The collars provide critical data on lion movement and behavior, but GPS collars can only tell so much. Captures are rare chances for hands-on checkups, and for F-95 that’s especially important, because she has a kink in her tail. Bell pulls up pictures of it from field cameras. "See her tail? It’s definitely not that sweeping tail of a regular, normal mountain lion. It does have a defect in it," said Bell. That defect may have been caused by an injury, or it may be a sign of something worse; Tail kinks are hallmarks of inbreeding. Among other things, the Wildlife Health Center is studying the genetic health of this mountain lion population, which is effectively separated from other populations by I-15 and other highways. “What we know is they are more restricted genetically – there’s less diversity in this population than in other mountain populations nearby," said Vickers. They don’t know what F-95’s tail means yet, so they want to get a closer look at her. The team keeps tabs on the trap with a handheld receiver that’ll notify them once it’s sprung. They check the signal every 10 to 15 minutes over several hours. There are a couple near misses, but finally, at midnight, a small group heads in to check whether she’s actually in the cage. It’s close to 1 a.m., and the woods are now pitch black. 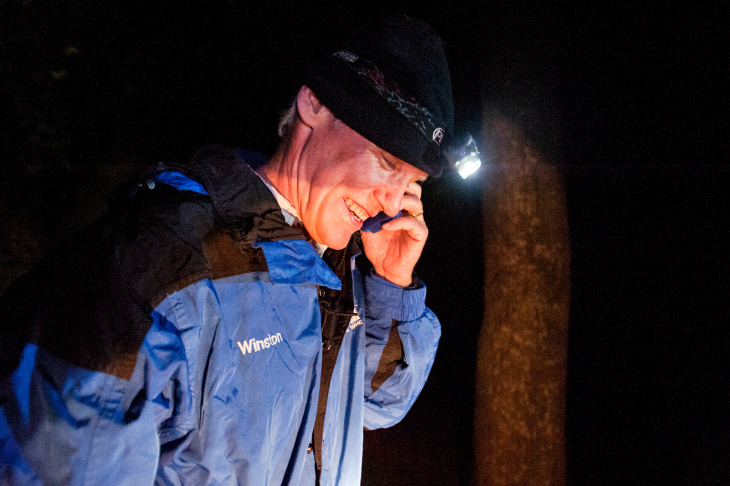 The only light comes from headlamps the researchers are wearing. As we make the final climb to the site, Vickers turns around and gives us the thumbs up. She’s in the cage. He pulls out his phone to share the good news with the others. It takes about half an hour to get back and set up the staging area. It’s a large tarp with medical equipment and tools holding down its edges. When they’re ready, Vickers loads sedative into a syringe at the end of a long jab pole, and then, two of them head towards the cage. F-95 has been calm up until this point. But as they approach her, she begins to lose her cool. Vickers's companion acts as a distraction while he eases up from behind. He slides the pole in between the bars, and then jabs. The sedative acts quickly, and she’s down within a few minutes. They carry her over to the staging area, where Vickers sets a timer. They know they have to be done and away from her within an hour. It’s a flurry of activity: some team members measure her tail and limbs while others monitor her vitals. Finally, they switch out her GPS collar. She looks healthy and strong, which is great, but it becomes a little problematic. She’s coming back too quickly, and they still have to weigh her. They decide it’s better to call it rather than give her more sedative since they've gotten most of what they need. They heft her onto the carry tarp and walk her out a couple hundred yards away. Everyone else heads back to start packing up. Vickers stands alone, watching her from a distance. He’s making sure she comes through ok – that she wakes up and that nothing attacks her while she’s still out of it. Over the next year, they’ll use satellites, computers and trail cameras to keep track of her. For now, he’s using his own eyes. Why are there so few Asian Americans in LA politics? Are there really 11 million undocumented immigrants in the US? How does the latest 'Great Gatsby' film compare to the classic novel?